Back to bento after a long weekend. This week, I am still making the San-X characters. So 4 more characters from San-X that will be presented in my kids' bento until Friday. 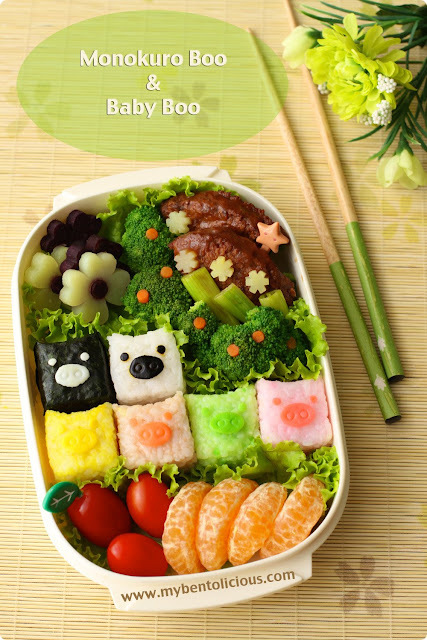 For simple Monday's bento, I chose Monokuro Boo and Baby Boo. I didn't make all 7 Baby Boo but only 4 of them. Perhaps because I felt hesitated to color the rice red, blue and purple. Yellow rice was mixed with egg, orange rice with tomato sauce, green rice with edamame, and pink rice with sakura denbu. The faces were decorated with colored egg sheets. The black one was the hardest one to make. I was mixing it with sweet soy sauce but it was too much soy sauce so it became a little bit watery and stained on the white rice. MONOKURO BOO are black and white piggies that love a simple life. They often say 'simple is the best' and they have square shaped bodies. BABY BOO are pastel or candy colored pigs. There are 7 Baby Boo which are Berry (pastel red), Peach (pastel pink), Orange (pastel orange), Lemon (pastel yellow), Mint (pastel green), Soda (pastel blue), Grape (pastel purple). Inside the box : beef patties, broccoli, flower shapes sweet purple potatoes & potatoes, baby roma tomatoes, and peeled orange. Love the candy colors in this one! Monokuro Boo sooo adorable! Can't wait to pop them all into my mouth :) Thank you for making my Sunday end on a happy note! Lovely bento, Lia! What a cute bunch of Boos! I recognize these faces from other bento I have seen but I didn't realize there were so many color variations! love the coloured monokuro - how cute is that!! @sherimiya : You are very quick Sheri! Yes, those square pigs are just one mouth bite size, maybe 2 bites for Andrew (?) hahaha ... :D Thanks a lot Sheri for always give me your sweet comment. Aww, they are so cute and the colors are so vibrant!!! Amazing bento as always Lia! @Kids Dream Work : Thanks a lot for your compliment! @Fluteloop : Thanks a lot for your kind words! Kalo aq dikasih, pasti gak ega makannya. i love all your san-x creations but this one is my absolute fave - i just love monokoru boo, and these five babies are absolutely perfect! how did you make their noses? the impressions of the nostrils and the borders are very precise, such a great detail! Lia I love Monokuro Boo!! I bought a bunch of stationary and such when I went to Japan 3 years ago, but now all that remains is one folder. Thanks for this cute reminder.